Welcome all to the official website of Wat Sangharatanaram also known as the Gold Coast Thai Temple. The Gold Coast Thai Temple has been established now for almost 15 years, located at 137 Beaudesert-Nerang Rd, Nerang QLD 4211. Wat Sangharatanaram is a public place of worship meaning that it is open to the general public. All are welcome to attend including Thais, non-Thais, Buddhists, non-Buddhists, all ages etc. Monks and facilities are provided for daily conduct of chanting, meditation, Dhamma talks and receiving offerings for merit-making of individuals and families. Monks can be invited for their one daily meal outside the temple. Functions are held on commemorative occasions for attendees to experience customs for merit-making, food offering, devotional practice and sermons familiar to Thai Buddhists in the Theravada, Dhammayuta tradition. Accredited teachers give lessons to young children of Thai migrants, to introduce them to the language, customs and values of Thailand. All monks and lay persons at our temple are volunteers. The temple is supported by donations from acceptable sources. Some fund-raising is conducted externally to the temple. Suitable grants are sought from government and philanthropic organisations. If you wish to visit the Gold Coast Thai Temple, we are open 7 days a week from 09:00am. We recommend to visit between the hours of 09:00am – 03:00pm. To find out more of what’s going on at our temple, please feel free to visit our News page. Further, the community gather on a regular basis on every first Sunday of each month. You can expect to learn and experience more of the Thai culture, meet new people and try some delicious Thai food! If you have any other questions, please feel free to visit our FAQ page for more information or contact us directly via our contact page. 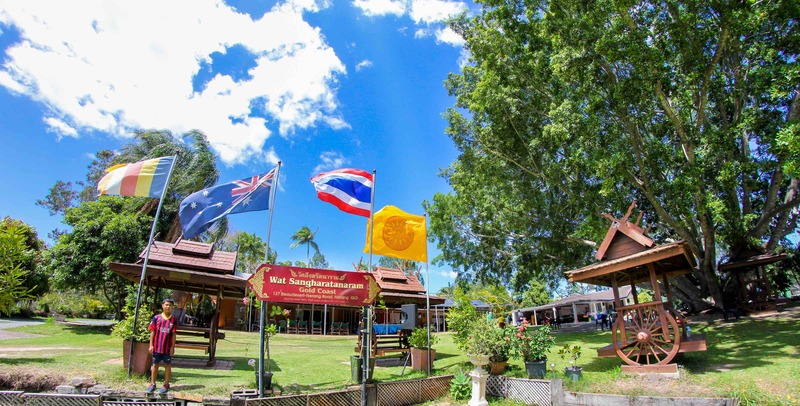 We look forward to welcoming you to Wat Sangharatanaram, the Gold Coast Thai Temple.